Novaled is a German start-up (a spin-off from Fraunhofer and Technical University of Dresden) established in 2001 that is developing and marketing transport, blocking, doping, interlayer and outcoupling materials that can be used for OLED displays and lighting panels. Novaled claims that using their technology and materials can boost the overall display product power efficiency by up to 40%, with a lifetime increase up to 500%. Their outcoupling solutions can further enhance power efficiency by up to 80%. 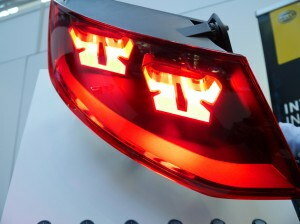 Besides OLED materials, Novaled also provides tailor-made OLED devices on glass or metal substrates. In 2013, Samsung acquired Novaled for €260 million. In November 2010 we interviewed their marketing chief. DSCC lowered its OLED material revenue forecasts, saying that the market is expected to grow at a 25% CAGR from $773 million in 2017 to $2.35 billion in 2022 (down from its previous estimates of $2.56 billion in 2022). The fastest growing (51% CAGR) OLED application will be OLED lighting, which will grow from $12 million in 2017 to $95 million in 2022. DSCC also published the material stack for Samsung's latest OLEDs (used in the Galaxy S9), which you can see above. 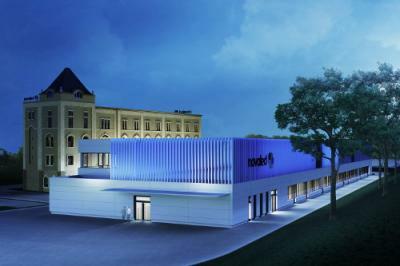 In January 2017 Novaled started constructing its new fab and office buildings in Dresden, that will comprise of a renovated old mill that will be turned into a prestigious office building and a new 110-meter long R&D plant with state-of-the-art research areas, laboratories and clean rooms. Novaled announced today that it has ordered OLED deposition systems from Sunic System for about $3 million. The new deposition system will increase Novaled's OLED production capacity by 40% and will offer more precise repeatability in processing. This is of course an R&D machine that is used to test Novaled's organic materials. In January 2017 Novaled started constructing its new fab and office buildings in Dresden, that will comprise of a renovated old mill that will be turned into a prestigious office building and a new 110-meter long R&D plant with state-of-the-art research areas, laboratories and clean rooms. Today Novaled celebrates the corner stone foundation for the new company premises. Samsung's decision to invest over €25 in the property purchase and construction shows the Korean OLED developer commitment to Novaled. The site's total space will be 10,200 m² - the old mill, which is under monument protection, will be renovated and transformed into a prestigious office building. and a 110 meter long new R&D plant will be built - and it will include research area, clean rooms and new laboratories. Digitimes Researcher states that currently Samsung Display and LG Display both rely on imported organic materials used in OLED production, but the two Korean makers aim to decrease this reliance. Both companies are buying stakes in companies outside of Korea (for example Samsung's Novaled acquisition and Sun Fine Chem investment) in order to obtain patents and move production in house, mostly at LG Chem and Samsung SDI. The polyimide used as a substrate in flexible OLEDs, for example, is produced by Japanese Ube Industries - and used by both LG and samsung. 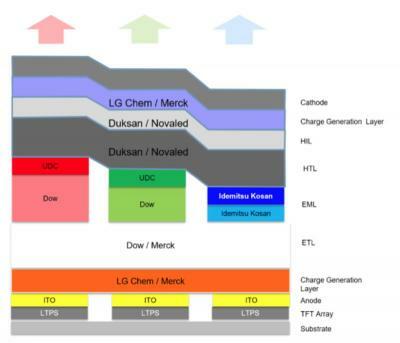 Several organic materials used in the OLED stack are produced by Universal Display (PHOLED emitters), Idemitsu Kosan, Dow Chemical and Merck. 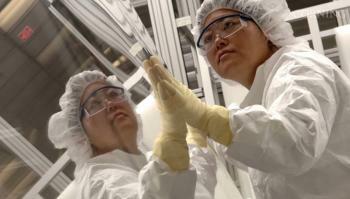 Both companies use glass mostly from Corning and high-temperature thin film for the back-end processing from 3M. Novaled has started constructing its new €20 million fab and office buildings. The new facility will be located in the north of Dresden, and will comprise of a renovated old mill that will be turned into a prestigious office building and a new 110-meter long R&D plant with state-of-the-art research areas, laboratories and clean rooms. Novaled says it is the world's only supplier of organic dopants for mass produced OLED displays - and also in OLED lighting panels. Novaled's materials are also used in OPV devices. Blue TADF developer Cynora announced that Dr. Andreas Haldi was appointed as its Chief Marketing Officer. With his strong technical and business experience, Andreas Haldi will reinforce Cynora in the forthcoming commercialization of its high performance blue OLED materials. Cynora, preparing the commercialization of its emitting materials for OLEDs, is hiring Andreas Haldi to further enhance its already good relationships with the major display makers and to now prepare with them the implementation of its materials in their products. According to UBI Research, the market for OLED emitting materials grew 17% from 2014 to 2015. Universal Display (the top supplier in terms of revenues), Dow Chemical and LG Chem saw a decrease in sales while Novaled, Idemitsu Kosan and Samsung SDI saw improved revenues. Samsung Display is the largest OLED producer by far, and so when it changes suppliers it changes the whole market. UBI says that in 2015 Idemitsu Kosan, the second supplier in terms of revenue started delivering blue fluorescent emitters to Samsung Display, and also enjoyed the ramp-up in OLED TV production by LGD. Next week at SID, Novaled will report on a new Vertical organic field-effect transistors (V-OFETs) that can be used to drive high-brightness AMOLED displays. Novaled says that the new backplane can be deposited on plastic backplanes, and it allows a 4X brightness enhancement compared to reference AMOLEDs. Vertical-OETs has been first reported in 2011 by the University of Florida. That particular research used carbon-nanotube based backplanes, and it was spun-off to form a company called nVerPix which is commercializing the technology. The European Commission, under its Horizon 2020 programme, launched a new project called Phebe that aims to develop and commercialize TADF OLED emitters. This three-year project's consortium includes Novaled, Astron-FIAMM, TU Dresden, Kaunas University of Technology, Durham University and other companies and universities. TU Dresden is focusing on material design using theoretical quantum chemical approaches, and KTU is elaborating synthetic schemes for exciplex emitters and intramolecular charge transfer materials and synthesizing the most promising compounds. Durham will perform photophysical characterisation of the new materials from Kaunus and will also be in charge of elucidating the mechanisms of TADF to feed into the theoretical work of TU Dresden. Novaled will provide best-fit transport and doping material sets, technology and expert know-how on stack architecture.